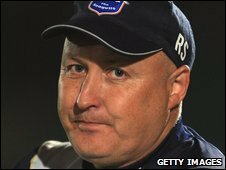 Leyton Orient have appointed former Yeovil Town boss Russell Slade as manager until the end of the season. The 49-year-old will take charge for Saturday's trip to Exeter, with Orient sitting one point outside the drop zone following Geraint Williams' sacking. Slade, whose managerial career started in 1994 at Notts County, took Yeovil to the League One play-off final in 2006, his first season in charge at the club. He had an eight-month spell in charge of Brighton last year. He took over the Seagulls last March and led them to safety in League One but left after a poor run this season. Slade took Scarborough from the bottom of the Conference to 12th place in 2001. He left the Yorkshire side when they entered administration two years later and took charge at Grimsby, leading them to the 2005/06 League Two play-off final. Williams left the O's on Saturday after just over a year in charge following the 3-1 defeat by Hartlepool. Kevin Nugent took caretaker charge for Monday's 2-1 defeat at Southampton.